Alfalfa, called by one eminent biologist, "THE GREAT HEALER", has been enthusiastically backed by many noted doctors, biologists, food and health authorities, who tell us that it contains more of the needed essential elements than almost any other plant or substance. The lack of elements is now considered to be one of the principal contributing causes of most human ailments. Along with its other amazing qualities, it has been found that alfalfa contains Vitamin U. Dr. Garnett Chaney, well-known food scientist of Stanford University, CA, has published his findings on Vitamin U, and asserts that it has great possibilities as as aid for peptic ulcers. In fact, according to the record, 80% of the ulcers so treated were healed. Alfalfa is the richest land grown source of trace minerals. The roots of this perennial plant burrow deep into the soil and absorb the important trace minerals and elements such as calcium, potassium, magnesium, iron and phosphorous. Combined with chlorophyll and other organic salts, these factors seem to balance the so-called salt system of the body and act as a natural diuretic. Alfalfa is most important for its Vitamin A and enzyme content. Vitamin A is important in building healthy skin, both outer and inner skin. The outer skin complexion improves, dryness is prevented and the skin becomes less susceptible to infection. The inner skin, or mucous membrane, is also greatly aided. The lining of the throat, nose, stomach and intestines are all improved with Vitamin A.
Enzymes are organic catalysts which promote chemical changes. Alfalfa contains the following seven enzymes: Protase, which acts in the digestion of proteins: Coagulase, Emulsin and Peroxidase, which have direct action upon the blood: Amylase and Invertase which act in the conversion of starches and sugars: and Lipase, a fat splitting enzyme. Hence, Alfalfa greatly assists digestion both by promoting healthy mucous membrane tissue, and providing enzymes which convert foods into useable form. As many or our enzymes are destroyed by routine cooking and food processing, it is beneficial to take a few alfalfa tabs before each meal. The use of alfalfa increases one's alkaline reserves and helps to offset the enervating effect of fatigue acids. It is beneficial to who have kidney or bladder trouble because it makes excretion of the kidney less acid and therefore less irritating to the urinary tract. The U.S.Dept. of Agriculture states that while the average fruit or vegetable is from one to ten units alkaline, alfalfa is 130 units alkaline. This alkaline nature makes the use of anti-acid tablets for digestion unnecessary. Chlorophyll is plentiful in alfalfa, and chlorophyll is known as a body cleanser, infection fighter and nature's deodorizer. This wonder of nature possesses the property of breaking down poisonous carbon dioxide, releasing oxygen in turn, thus inhibiting or reducing the action of anaerobic bacteria. Try this experiment. If your dog has bad odor or bad smelly breath try crushing a couple of alfalfa tabs on his food. Alfalfa is rich in Vitamin K, which helps develop fibrin, which in turn protects against hemorrhaging by helping the blood to clot properly. It contains 20,000 to 40,000 units of Vitamin K for every 100 grams. 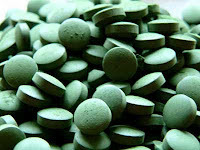 From the 2003 Shaklee catalog, page 19: "includes alfalfa, spearmint, and more; contains no fungicides, bacteriocides, synthetic hormones, growth regulators, or chemicals; 10 Alfalfa Complex tablets provide 300 mg of calcium, about as much calcium as in a glass of milk." Update From the 2013 Shaklee Catalog: Alfalfa is a store house of nutrients. It's taproot reaches down as deep as 20 feet, searching out nutrients and minerals from deposits in the soil while it's leaves gather large amounts of chlorophyll through the natural process of photosyntheses. 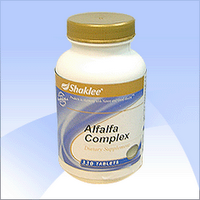 Alfalfa complex is a Shaklee Signature Formula orginally developed by Dr. Shaklee. We use only the finest alfalfa grown in California, ensuring a wide range of nutrients, including calcium and phosphorus, as well as chlorophyll, bioflavonoids, trace minerals, and vitamins. We believe your home should be the safest place in the world. Go to your cupboard right now. Pick a cleaner. Did you know many traditional cleaners contain stuff listed in this video? Now look at the tiny small print. Education is key to making better choices. Here's a "Clean Clincher" for ya.. Did you know one bottle of Shaklee Basic H2 equals the cleaning uses of 5,824 bottles of windex? An unbelievable amount of supersafe, really powerful, grease-busting clean comes out of these bottles. Talk about cost effective... You can use it to clean oil on driveways, barbecue grills, ovens and so much more.